An electronic cigarette is a battery-powered vaporizer which simulates the feeling of smoking, but without burning tobacco. Their use is commonly called “vaping”. The user activates the e-cigarette by taking a puff or pressing a button. They are often cylindrical, but come in many variations. Some look like traditional cigarettes. Most are reusable but there are also disposable versions called first generation cigalikes. There are also second, third, and fourth generation devices. Instead of cigarette smoke, the user inhales an aerosol, commonly called vapor. E-cigarettes typically have a heating element that atomizes a liquid solution known as e-liquid. E-liquids usually contain propylene glycol, glycerin, water, nicotine, and flavorings. E-liquids are also sold without propylene glycol, without nicotine, or without flavors. The benefits and the health risks of e-cigarettes are uncertain. There is tentative evidence that they can help people quit smoking, but they have not been proven better than regulated medication. As of 2014[update], their usefulness in tobacco harm reduction is unclear, but they have a potential to be part of the strategy to decrease tobacco related death and disease. Their safety risk to users is estimated to be similar to that of smokeless tobacco. Regulated US Food and Drug Administration (FDA) nicotine replacement products are safer than e-cigarettes, but e-cigarettes are probably safer than smoking. Dry herb vaporizers can be used to inhale marijuana. 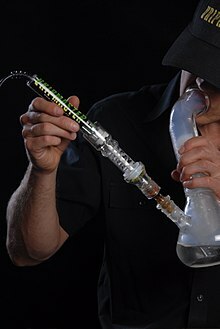 Of the studies about vaporizing marijuana, few have addressed the quality of the vapor extracted and delivered; instead, studies usually focus on the mode of usage of the vaporizers. There are 483 identifiable chemical constituents known to exist in the cannabis plant, and at least 85 different cannabinoids have been isolated from the plant. The aromatic terpenoids begin to vaporize at 126.0 °C (258.8 °F), but the more bio-active tetrahydrocannabinol (THC), cannabidiol (CBD) and cannabinol (CBN) do not vaporize until near their respective boiling points: THC 157 °C (315 °F), CBD 160–180 °C (320–356 °F), and CBN 185 °C (365 °F). Vaporizers can also be used to inhale cannabis oil and waxy concentrates that have been extracted from the plant. Sometimes the oil is also mixed with propylene glycol and polyethylene glycol to make it less viscous. Vaporizing is more efficient than smoking, because approximately 30% of THC in marijuana or hashish cigarettes is destroyed by pyrolysis during smoking. Vaporizers can be used to inhale other recreational drugs as well. A wide variety can be consumed this way, either dissolved in e-liquid or vaporized directly. The use of e-cigarettes to inhale the psychedelic drug DMT has been reported. Studies have shown that vaporizing cannabis exposes the user to lower levels of harmful substances than smoking cannabis. These findings are important for it is estimated that 10–20 percent of patients with chronic pain, multiple sclerosis, epilepsy, and HIV/AIDS have admitted to smoking cannabis for therapeutic purposes. For patients, a study found that smoking cannabis sativa reduced daily pain by 34%, a statistically significant amount. In a study published in the Journal of Psychopharmacology in May 2008, it was stated that vaporizers were a “suitable method for the administration of THC”. A 2007 study by the University of California, San Francisco, published in the Journal of the American Academy of Neurology, found that “there was virtually no exposure to harmful combustion products using the vaporizing device”. A 2006 study performed by researchers at Leiden University found that vaporizers were “safe and effective cannabinoid delivery system(s)”. The study stated that the amount of THC delivered by vaporizers were equivalent to the amount delivered by smoking. Because of those studies and other studies, vaporizers are considered medically sound devices for delivering THC. Not all those have been scientifically tested. Research using vaporizers found the delivery efficiency highest at around 226 °C (439 °F), falling to about half efficiency at 150 °C (302 °F) to 180 °C (356 °F) degrees depending on material. The purest preparations produced the highest efficiencies, about 56% for pure THC versus 29% for plant material (female flower tops) with 12% THCA content. Besides THC, several other cannabinoids as well as a range of other plant components including terpenoids were detected in the plant material. Using pure THC in the vaporizer, no degradation products (delta-8-THC (D8-THC), cannabinol (CBN), or unknown compounds) were detected by HPLC analysis. The longer vapor is stored, the more THC is lost as it condenses on the surface of the vaporizer or the balloon. This loss may be negligible over a few minutes but may exceed 50% after 90 minutes. The Leiden University study found that as much as 30–40% of inhaled THC was not absorbed by the lungs but simply exhaled. However, they did not find large individual differences in the amounts exhaled. Vaporizers are sometimes used by chefs as a method of applying controlled heat to herbs and spices to release flavors that are otherwise difficult to titrate or apply, or that might be spoiled by overheating during cooking. Grant Achatz, chef-proprietor of Alinea in Chicago, “uses the aroma-filled bags as place-mats, punctured when plates are placed in front of the customer”. ^ Stephen A. Greene (2002). Veterinary Anesthesia and Pain Management Secrets. 74: Elsevier Health Sciences. ISBN 978-1560534426. ^ Earleywine M, Barnwell SS (2007). “Decreased respiratory symptoms in cannabis users who vaporize”. Harm Reduction Journal. 4: 11. doi:10.1186/1477-7517-4-11. PMC 1853086. PMID 17437626. 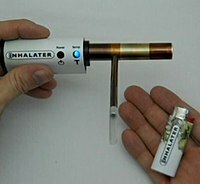 “Vaporizers for Medical Marijuana”. www.aids.org. Archived from the original on 2010-07-18. Retrieved 2008-07-28. ^ Grotenhermen F (June 2001). “Harm Reduction Associated with Inhalation and Oral Administration of Cannabis and THC”. Journal of Cannabis Therapeutics. 1 (3 & 4): 133–152. doi:10.1300/J175v01n03_09. ^ a b Abrams DI, Vizoso HP, Shade SB, Jay C, Kelly ME, Benowitz NL (November 2007). “Vaporization as a smokeless cannabis delivery system: a pilot study” (PDF). Clinical Pharmacology and Therapeutics. 82 (5): 572–578. doi:10.1038/sj.clpt.6100200. PMID 17429350. ^ “The Centennial Celebration – Washington, D.C. September 13–17, 1948”. Science. 108 (2800): 205–206. August 1948. doi:10.1126/science.108.2800.205. PMID 17821306. ^ Caponnetto, Pasquale; Campagna, Davide; Papale, Gabriella; Russo, Cristina; Polosa, Riccardo (2012). “The emerging phenomenon of electronic cigarettes”. Expert Review of Respiratory Medicine. 6 (1): 63–74. doi:10.1586/ers.11.92. ISSN 1747-6348. PMID 22283580. ^ a b Orellana-Barrios, Menfil A.; Payne, Drew; Mulkey, Zachary; Nugent, Kenneth (2015). “Electronic cigarettes-a narrative review for clinicians”. The American Journal of Medicine. 128 (7): 674–81. doi:10.1016/j.amjmed.2015.01.033. ISSN 0002-9343. PMID 25731134. ^ Grana, R; Benowitz, N; Glantz, SA (13 May 2014). “E-cigarettes: a scientific review”. Circulation. 129 (19): 1972–86. doi:10.1161/circulationaha.114.007667. PMC 4018182. PMID 24821826. ^ Pepper, J. K.; Brewer, N. T. (2013). “Electronic nicotine delivery system (electronic cigarette) awareness, use, reactions and beliefs: a systematic review”. Tobacco Control. 23 (5): 375–384. doi:10.1136/tobaccocontrol-2013-051122. ISSN 0964-4563. PMC 4520227. PMID 24259045. ^ Bhatnagar, A.; Whitsel, L. P.; Ribisl, K. M.; Bullen, C.; Chaloupka, F.; Piano, M. R.; Robertson, R. M.; McAuley, T.; Goff, D.; Benowitz, N. (24 August 2014). “Electronic Cigarettes: A Policy Statement From the American Heart Association”. Circulation. 130 (16): 1418–1436. doi:10.1161/CIR.0000000000000107. PMID 25156991. ^ Hayden McRobbie (2014). “Electronic cigarettes” (PDF). National Centre for Smoking Cessation and Training. pp. 1–16. ^ Farsalinos KE, Spyrou A, Tsimopoulou K, Stefopoulos C, Romagna G, Voudris V (2014). “Nicotine absorption from electronic cigarette use: Comparison between first and new-generation devices”. Scientific Reports. 4: 4133. doi:10.1038/srep04133. PMC 3935206. PMID 24569565. ^ Konstantinos Farsalinos. “Electronic cigarette evolution from the first to fourth generation and beyond” (PDF). gfn.net.co. Global Forum on Nicotine. Retrieved 23 September 2015. ^ Cheng, T. (2014). “Chemical evaluation of electronic cigarettes”. Tobacco Control. 23 (Supplement 2): ii11–ii17. doi:10.1136/tobaccocontrol-2013-051482. ISSN 0964-4563. PMC 3995255. PMID 24732157. ^ Weaver, Michael; Breland, Alison; Spindle, Tory; Eissenberg, Thomas (2014). “Electronic Cigarettes”. Journal of Addiction Medicine. 8 (4): 234–240. doi:10.1097/ADM.0000000000000043. ISSN 1932-0620. PMC 4123220. PMID 25089953. ^ Cooke, Andrew; Fergeson, Jennifer; Bulkhi, Adeeb; Casale, Thomas B. (2015). “The Electronic Cigarette: The Good, the Bad, and the Ugly”. The Journal of Allergy and Clinical Immunology: In Practice. 3 (4): 498–505. doi:10.1016/j.jaip.2015.05.022. ISSN 2213-2198. PMID 26164573. ^ Oh, Anne Y.; Kacker, Ashutosh (December 2014). “Do electronic cigarettes impart a lower potential disease burden than conventional tobacco cigarettes? : Review on e-cigarette vapor versus tobacco smoke”. The Laryngoscope. 124 (12): 2702–2706. doi:10.1002/lary.24750. PMID 25302452. ^ Brandon, T. H.; Goniewicz, M. L.; Hanna, N. H.; Hatsukami, D. K.; Herbst, R. S.; Hobin, J. A.; Ostroff, J. S.; Shields, P. G.; Toll, B. A.; Tyne, C. A.; Viswanath, K.; Warren, G. W. (2015). “Electronic Nicotine Delivery Systems: A Policy Statement from the American Association for Cancer Research and the American Society of Clinical Oncology”. Clinical Cancer Research. 21 (3): 514–525. doi:10.1158/1078-0432.CCR-14-2544. ISSN 1078-0432. PMID 25573384. ^ a b McRobbie, Hayden; Bullen, Chris; Hartmann-Boyce, Jamie; Hajek, Peter; McRobbie, Hayden (2014). “Electronic cigarettes for smoking cessation and reduction”. The Cochrane Library. 12 (12): CD010216. doi:10.1002/14651858.CD010216.pub2. PMID 25515689. ^ Ebbert, Jon O.; Agunwamba, Amenah A.; Rutten, Lila J. (2015). “Counseling Patients on the Use of Electronic Cigarettes”. Mayo Clinic Proceedings. 90 (1): 128–134. doi:10.1016/j.mayocp.2014.11.004. ISSN 0025-6196. PMID 25572196. ^ Siu, AL (22 September 2015). “Behavioral and Pharmacotherapy Interventions for Tobacco Smoking Cessation in Adults, Including Pregnant Women: U.S. Preventive Services Task Force Recommendation Statement”. Annals of Internal Medicine. 163 (8): 622–34. doi:10.7326/M15-2023. PMID 26389730. ^ a b Harrell, PT; Simmons, VN; Correa, JB; Padhya, TA; Brandon, TH (4 June 2014). “Electronic Nicotine Delivery Systems (“E-cigarettes”): Review of Safety and Smoking Cessation Efficacy”. Otolaryngology–Head and Neck Surgery. 151 (3): 381–393. doi:10.1177/0194599814536847. PMC 4376316. PMID 24898072. ^ a b Drummond, MB; Upson, D (February 2014). “Electronic cigarettes. Potential harms and benefits”. Annals of the American Thoracic Society. 11 (2): 236–42. doi:10.1513/annalsats.201311-391fr. PMC 5469426. PMID 24575993. ^ M., Z.; Siegel, M (February 2011). “Electronic cigarettes as a harm reduction strategy for tobacco control: a step forward or a repeat of past mistakes?”. Journal of Public Health Policy. 32 (1): 16–31. doi:10.1057/jphp.2010.41. PMID 21150942. ^ Caponnetto P; Russo C; Bruno CM; Alamo A; Amaradio MD; Polosa R. (Mar 2013). “Electronic cigarette: a possible substitute for cigarette dependence”. Monaldi Archives for Chest Disease. 79 (1): 12–19. doi:10.4081/monaldi.2013.104. PMID 23741941. ^ Golub, Justin S.; Samy, Ravi N. (2015). “Preventing or reducing smoking-related complications in otologic and neurotologic surgery”. Current Opinion in Otolaryngology & Head and Neck Surgery. 23 (5): 334–340. doi:10.1097/MOO.0000000000000184. ISSN 1068-9508. PMID 26339963. ^ “Benefits of Using a Dry Herb Vaporizer”. KingPenVapes. July 21, 2016. Retrieved June 2, 2018. ^ “What chemicals are in marijuana and its byproducts?”. ProCon.org. 2009. Retrieved 2013-01-13. ^ El-Alfy; Abir T; et al. (Jun 2010). “Antidepressant-like effect of delta-9-tetrahydrocannabinol and other cannabinoids isolated from Cannabis sativa L”. Pharmacology Biochemistry and Behavior. 95 (4): 434–42. doi:10.1016/j.pbb.2010.03.004. PMC 2866040. PMID 20332000. ^ “Methods of Medicating with Marijuana”. evaluationtoday.com. Retrieved 10 February 2014. ^ a b c McPartland JM, Russo EB (2001). “Cannabis and cannabis extracts: greater than the sum of their parts?” (PDF). Journal of Cannabis Therapeutics. 1 (3/4): 103–132. doi:10.1300/J175v01n03_08. ^ Lewis, Amanda. “Are Weed Vape Pens Safe?”. Rolling Stone. Retrieved 2018-06-22. ^ Varlet V (December 2016). “Drug Vaping: From the Dangers of Misuse to New Therapeutic Devices”. Toxics. 4 (4): 29. doi:10.3390/toxics4040029. PMC 5606648. PMID 29051432. ^ Hamill, Jasper. “Digital druggies turn electronic cigarettes into ‘psychedelic crack’ pipes”. Daily Mirror. Retrieved 6 July 2018. ^ a b Gieringer, Dale; St. Laurent, Joseph; Goodrich, Scott (9 February 2004). “Cannabis Vaporizer Combines Efficient Delivery of THC with Effective Suppression of Pyrolytic Compounds” (PDF). Journal of Cannabis Therapeutics. 4 (1): 7–27. doi:10.1300/J175v04n01_02. Retrieved June 20, 2010. ^ “Marijuana Vaporizer Provides Same Level Of THC, Fewer Toxins, Study Shows”, Official Journal of the American Academy of Neurology (summarized by Science Daily) (2007-05-16)”. Sciencedaily.com. 2007-05-16. Retrieved 2011-02-23. ^ “Cal NORML/MAPS Study Shows Vaporizer Can Drastically Reduce Toxins in Marijuana Smoke”. Canorml.org. Retrieved 2011-02-23. ^ a b c d e f g Hazekamp A, Ruhaak R, Zuurman L, van Gerven J, Verpoorte R (June 2006). “Evaluation of a vaporizing device (Volcano) for the pulmonary administration of tetrahydrocannabinol”. Journal of Pharmaceutical Sciences. 95 (6): 1308–17. doi:10.1002/jps.20574. PMID 16637053. ^ Barohn, Richard (2013). Peripheral Neuropathies, An Issue of Neurologic Clinics. Elsevier. ISBN 978-1455771226. ^ Zuurman L; Roy C; Schoemaker RC; et al. (September 2008). “Effect of intrapulmonary tetrahydrocannabinol administration in humans”. Journal of Psychopharmacology. 22 (7): 707–16. doi:10.1177/0269881108089581. PMID 18515447. ^ Gieringer DH (June 2001). “Cannabis ‘Vaporization‘“. Journal of Cannabis Therapeutics. 1 (3 & 4): 153–170. doi:10.1300/J175v01n03_10. ^ a b Bob Gledhill. “Alinea restaurant uses Volcano as flavorizer”. Caterersearch.com. Retrieved 2011-02-23. ^ “Tools for creating aromatic flavors”. Chow.com. 2007-01-18. Retrieved 2011-02-23. ^ “Volcano used to release nutmeg aroma”. Rimag.com. Archived from the original on 2009-01-24. Retrieved 2011-02-23.